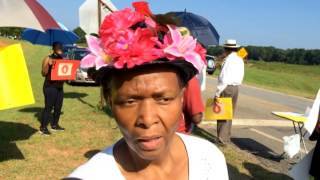 Nobody says it better than Dougherty County native Gloria Gaines, this time at the protest last Saturday at the Albany Sabal Trail office. This is a terrible imposition on this majority African-American community…. It is a terrible environmental justice against this community. And I’m just happy to see all the people out here today, because they clearly understand: if we don’t want this in our community, that we must stand up and say so…. This is our beloved Dougherty County and we’re all fighting to keep it as it is. If this pipeline and this compressor station comes through here, nobody’s going to want to come live here anymore and we’re just going to die on the vine. So. We’ve got to stand up!